This is the story of a cycle tour of the Fraser Canyon, Caribou Highway, Chilcotin Plateau, and Vancouver Island that we did in late June and early July of 2010. We started and finished the tour from our home in Vancouver. This tour started life as a 1000 km brevet for our cycling club, the BC Randonneurs. It was inspired by Susan's observation that Google Maps says that it is almost exactly 1000 km from our house on the west side of Vancouver to Bella Coola. In 2009 the brevet was scheduled to start on the long weekend at the beginning of August. The plan was to ride the 1000 km brevet and then take the ferry from Bella Coola to Port Hardy, and ride home down Vancouver Island, with a stop to visit the U'mista Cultural Centre at Alert Bay, over 4 days. We didn't start the 2009 event because of the heat wave in southern BC at the beginning of August 2009, and the wildfires farther north. We supported our friends Keith and Nigel who attempted that ride. They were turned back where Highway 20 was closed between Williams Lake and Riske Creek due to wildfires. You can read Keith's account of that ride. In 2010 the brevet was scheduled for late June to try to avoid the summer heat and wildfires. A few weeks beforehand we decided that we would enjoy the ride more as a 6 day "fast tour" than as a 75 hour brevet. Two BC Randonneurs riders, Alex and Gary, did attempt that edition of the brevet, and you can read both Alex's and Gary's stories of their adventures. Our definition of a "fast tour" is that we travel as lightly loaded as we can, eating in restaurants and cafés, staying in motels and lodges, and riding up to 10 or 12 hours a day, covering distances of anywhere from 160 to 240 km a day. We rode our Gunnar Sport bikes and each carried a rack pack and a single, small pannier. The distances between services on this route can be very large, so we spent a lot of time planning where we would eat and sleep. 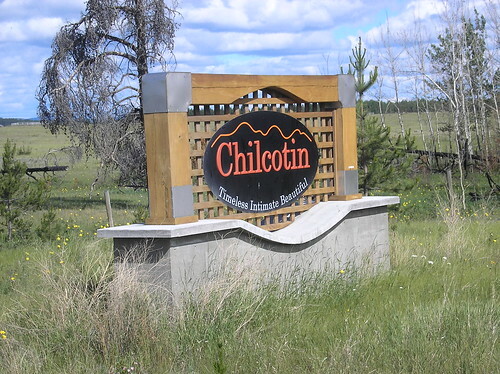 We pre-booked all of our accommodations, and our ferry passage from Bella Coola to Port Hardy, and we contacted most of the places we planned to eat while in the Chilcotin to confirm their hours. This was an adventure ride. It called on a lot of the skills that we have learned in over 20 years of travelling by bicycle, and riding brevets for almost that long. It certainly called on the fitness we had developed through a winter and spring of hard training, and a springtime of riding brevets almost every weekend. It's was a wonderful trip, and if you want to try to duplicate some or all of it, go for it, but please make sure that you are prepared, both physically, and logistically. We left home at 06:30. Susan B rode with us for the 1st day. Rode the 10th Ave bike route and the Central Valley Greenway as far as Winston St. CVG is a nice alternative to Broadway and Lougheed Hwy; parts of it are really pretty, and even the more industrial bits were well marked. 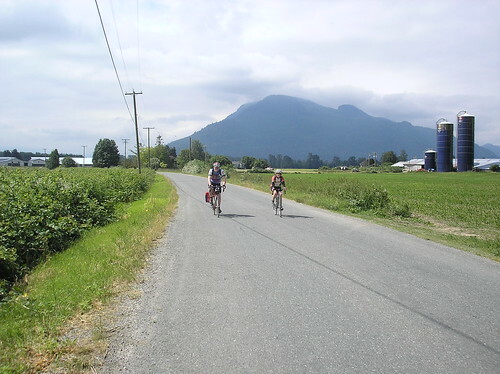 Once we re-joined Lougheed Hwy near North Rd, the ride to Mission was pretty typical of all of the brevet rides we've done on that section. Susan B pulled lots, and we had a brief pull by a passing triathlete between the Haney Bypass and 240th St.
We stopped at Rocko's Diner in Mission for 2nd breakfast. Arrived there on schedule, and left 10 minutes later than the planned 30 minute stop. Susan B had researched the Nicomen Island Trunk Rd as an alternative to Lougheed east of Mission where the road shoulder is gone and the motorists are particularly aggressive at passing too close. The Trunk Rd bypasses almost all of that stupid traffic and only adds about 2 km -- well worth it! With a strenghening tailwind, we flew through Deroche, and past Lake Errock, until Doug had to stop to fix a pinch flat -- an inauspicious start to his trial of a pair of Continental Grand Prix 4 Season tires. Rolling again, we crossed the Harrison River bridge. The climb over Woodside only slowed us down a little, and we recorded our maximum speeds for the trip on the descent down the east side. The store at the intersection of Lougheed Hwy and Harrison Hot Springs Rd is a favourite stop for us, and the drink of choice is almost always Starbuck's bottled frappuccino -- today was no exception. The tailwind continued, and strengthened, pushing us along the Haig Hwy east of Agassiz. This section of road seems to be less travelled by motor vehicles than ever this year. I wonder if it's because the removal of the tolls on the Coquihalla has really pulled that much more traffic out of the Frase Canyon, or perhaps moer people are driving by GPS and the freeway on the other side of the river is the defaut route. More help from the tailwind made the climb up to Lake of the Woods seem easy. We arrived at the Dogwood CafÃ© at 14:30 for a late lunch. Continuing up the canyon, through Yale, and Spuzzum, Susan took a lot of pictures from the bike, and even some accidental video. We had 2 brief delays for construction; one for paving just south of Spuzzum, and the other for the work being done one the Anderson Creek bridge. We arrived at the Canyon Alpine Motel at 18:00, right on schedule, if one were good at rationalizing in delays and unplanned stops :-) After showers, we had dinner in the restaurant, including excellent rhubarb pie, and we were in bed by 20:00. Generated on: 2010-09-02. Generated by Docutils from reStructuredText source.